How to watch Bad Guys: Season 1 (2014) on Netflix Finland! Sorry, Bad Guys: Season 1 is not available on Finnish Netflix, but you can unlock it right now in Finland and start watching! With a few simple steps you can change your Netflix region to a country like Argentina and start watching Argentine Netflix, which includes Bad Guys: Season 1. We'll keep checking Netflix Finland for Bad Guys: Season 1, and this page will be updated with any changes. Bad Guys: Season 1 is not available in Finland BUT it can be unlocked and viewed! Reinstated to eradicate the worst crimes in the city, a detective requests the release of three convicts to enlist their help in catching the felons. A notorious mobster. A genius serial killer. A fail-proof hit man. It takes bad guys to handle the bad guys. Season 1 of Bad Guys has 11 episodes. Because different Netflix countries have different availability for episodes, you'll need to check the episode listing below to see which are available in Finland. Realizing that laws and justice won't catch criminals, police chief Nam Gu-hyeon reaches out to Oh Gu-tak, an ex-officer known for his mercilessness. While on the move to the crime scene, Jeong Tae-su, the former hit man, suddenly stops the van and asks to visit a nearby neighborhood. The police fail to respond in time to a kidnapping incident. Enraged by their incompetence, Chief Nam again turns to Gu-tak and the "Mad Dogs." The city is gripped by an increase in human trafficking cases. While free from prison, each of the three bad guys revisits people from their pasts. Multiple people are killed at a city park by a man who randomly opened fire. Gu-tak and his special investigation team happen to pass by the site. 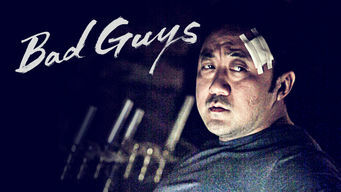 Following Woong-cheol's GPS tracking signal, Gu-tak and the team end up in an isolated area in the woods and face a gang of black-suited men. Fingerprints found on a weapon that killed a man and the suspect himself suggest a murder-suicide, but Tae-su suspects something else. Jeong-mun locates the agent whom he hired years ago to spy on himself and learns of his shocking connection to Gu-tak and a serial killing incident. Officer Yoo Mi-yeong questions Gu-tak's motive for choosing the three convicts in particular. How they all met unfolds by a flashback. Gu-tak confesses the truth about the investigation team. Meanwhile, Jeong-mun's fingerprints are found at the murder site of Woong-cheol's friend. Sensing something wrong from Chief Nam's phone call, Gu-tak tracks down his location. Soon after the team arrives at the site, several vans roll in.